We're finally up and running with the Cropstop blog again. After experiencing quite a few problems on our other blog platform (culminating in being locked out completely!) we've decided to move back to Blogspot and resume were we left off. Next Monday (April 2) we will resume our monthly link challenges so be sure to come by and link up any projects that include products from companies Cropstop carries in the store. For step by step instruction on putting this card together as well as a mini tutorial on Crayon Resist: Visit today's post on the Cropstop Blog. Beautiful Esther! I haven't done this technique in years ... thanks for inspiration! Thanks so much for joining in the fun at our Double D ‘Just Wing It’ challenge! Good Luck and we hope you’ll come back often. Oooh glad you got that all sorted out! Phew! Such a pretty card! Beautiful flowers, love the birdcage and that magnificent butterfly! 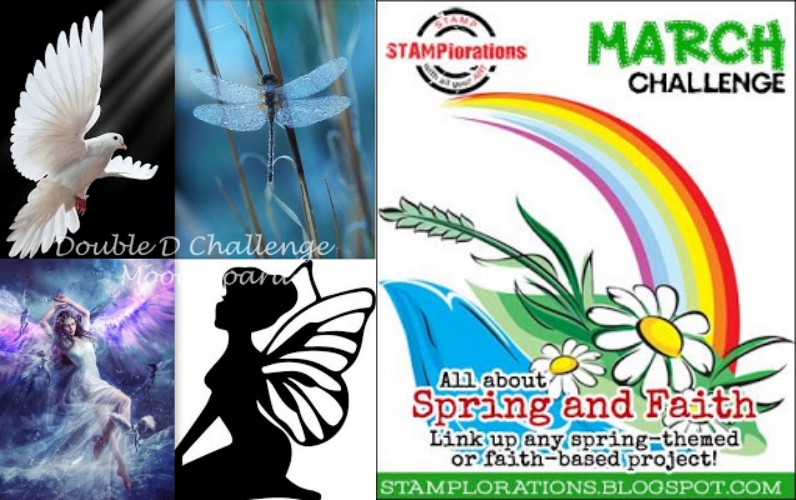 Thanks so much for playing along with us at The Double D Challenge Blog, Just ‘Wing’ It, Donna DT Member. I quite like reading an artiucle that can make people think. I don't think I have tried this technique, such beautiful results, love the bird cage! !